Food: Water, hot chocolate, and trail mix provided. Provided Equipment: All equipment provided (helmet, harness, pulleys). Recommended clothing: Stable closed toed shoes required. Dress in layers, bring rain gear. Professional mountain guides with world expedition experience will lead you on an exciting climbing and zip lining adventures in the mountains of the White Pass. This tour offers great climbs for all abilities and no matter what your experience level: you will be challenged! Take a short, narrated driving tour through historic downtown Skagway and up the Klondike Highway where you will hike to the base of majestic rock cliffs recently smoothed by retreating glaciers. 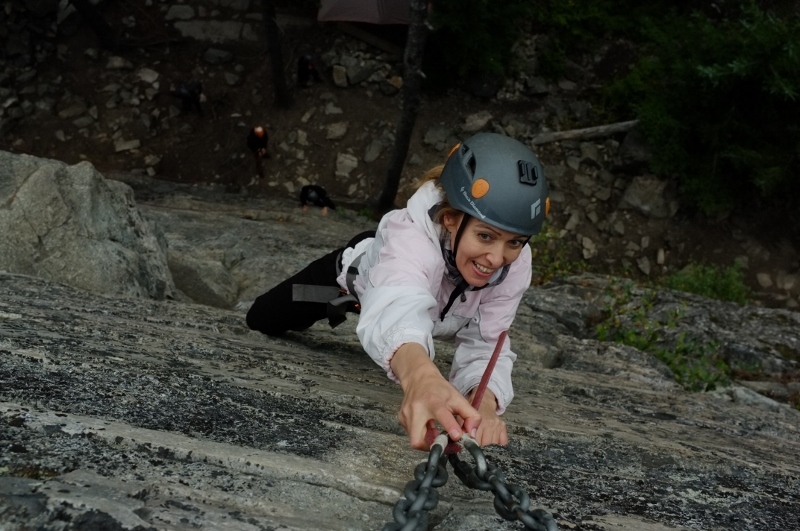 After receiving your equipment and safety orientation, you will rope up and start climbing the clean granite. No experience is necessary, choose from more than a dozen routes ranging from easy to very challenging. 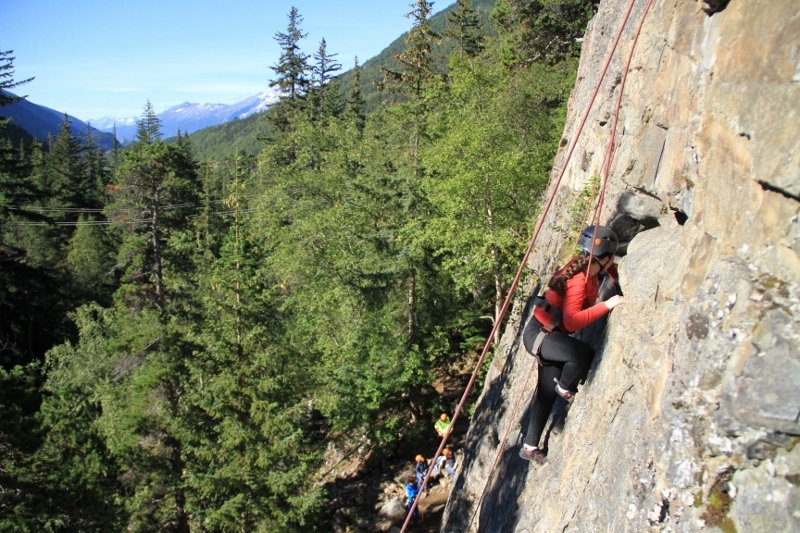 Each climb ends with a stunning aerial view of the Skagway River, The White Pass & Yukon Route Railway, and the surrounding wilderness. You will have the chance to climb routes matched to your ability level and then try a thrilling 70-foot rappel. 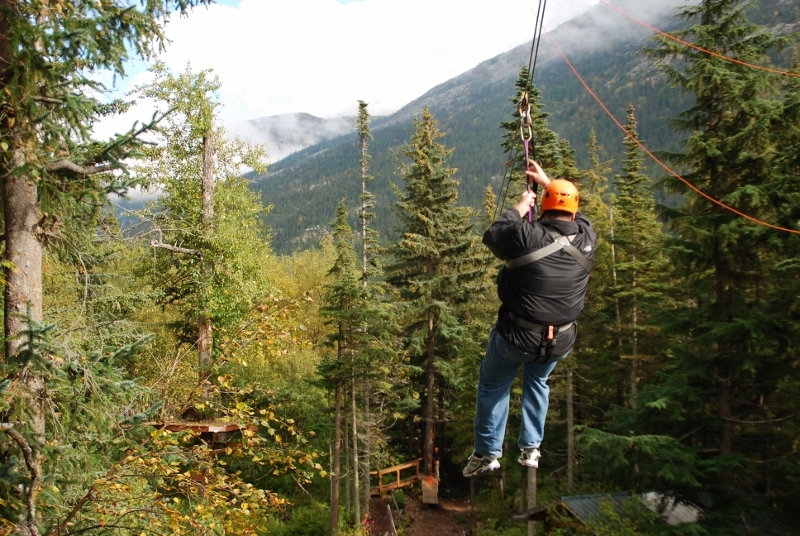 Next up on your excursion is a series of five exhilarating zip lines through the lush Alaska forest canopy. Our double cable system has a hands-free guide-controlled braking system which allows you to focus on having fun and not on braking yourself! As you zip from platform to platform, fellow participants cheer you on. This combination adventure gives you the excitement and thrill of two activities on one incredible excursion! (~10 minutes) – Your friendly tour guide will meet you near the Skagway Small Boat harbor sign and restrooms. Here they will take the opportunity to get to know you and provide answers to any questions that you might have about your upcoming excursion. (~20 minutes) – We’ll depart from our meeting point by van for an interpretive driving tour of historic downtown Skagway on our way up the Klondike Highway to our private rock climbing and zip line site on Porcupine Mountain. (~15 minutes) – From our private parking area, a short uphill walk along our forest nature trail will bring us to our excursion base camp. Here, your expert guides will get you outfitted with state of the art climbing equipment including a helmet, harness and climbing shoes. Next, you’ll receive a thorough orientation and safety briefing for your upcoming climbing experience. (~ 120 minutes) – You will spend the next two hours climbing on our over one dozen climbing routes. Each climber will have the opportunity to try out at least two climbs and a 70-foot rappel on backup belay. (~ 15 minutes) – Next we’ll get you geared up for your zip line adventure portion of the tour. Your guides will get you setup with all of the necessary zip line equipment. Then, you will receive a thorough safety briefing and orientation. 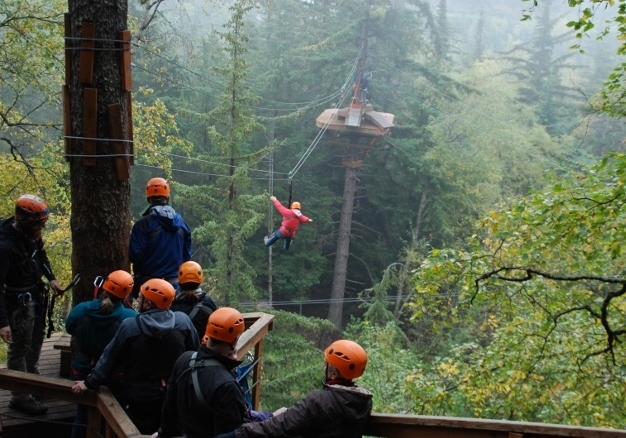 (~ 60 minutes) – Your guides will then lead you on a series of 5 zip lines through the lush Alaskan canopy. 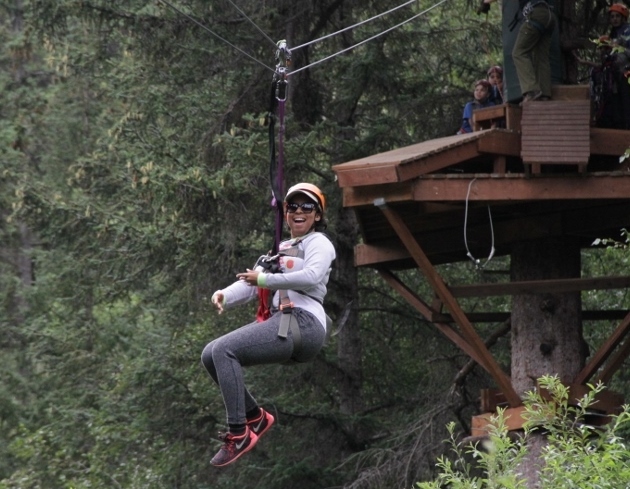 Our zip line course uses a guide-controlled hands-free braking system. So you’ll just be able to sit back and enjoy the ride as you zoom through the trees. (~ 15 minutes) – Our adventure wraps up in our rough-cut timber kiosk for some hot cocoa and trail mix snacks. (~15 minutes) – A short walk back down the nature trail will bring us back to our private parking area. We’ll depart the trail for a scenic ride back through the Skagway Valley and back to town. Who are my tour guides? Your guides are experts in the industry. They are fun, well-trained and passionate about guiding and sharing their expert knowledge about the history and natural wonder of Haines and Skagway, Alaska with you! Our staff all go through extensive training and hold current first-aid (mostly WFR and WEMT) certification. Many of our guides also lead courses and guided expedition trips for us both in Alaska and throughout the world. It is all top-rope climbing on actual granite! 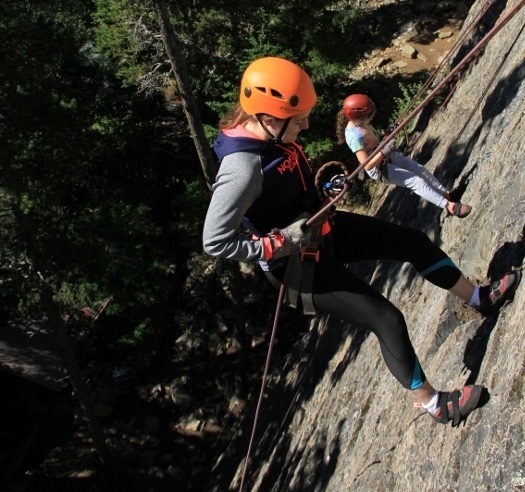 We have 12 climbs that range from 25 ft to 60 ft, and difficulty ranges from about 5.4 to 5.9, and our professional guides do all the belaying for you. They range from just under 100' to over 200', and you will be as high as 80' in the air! Restrooms are available on the dock prior to departing for your tour, and a non-flushing restroom is at the start/finish of the walk up to the rock and zip site. Our tours embrace Southeast Alaska’s unpredictable weather. Our excursions run rain or shine. If in a rare instance weather does cause us to cancel the tour you will be refunded in full and provided with assistance with finding an alternative activity for the day.